I started (late) blogging through the Alphabet, and I'm continuing to be late. Because this was an insane week. Insane. So, "last week's topic" (since I'm late) is C is for Credits. I had more in mind for this than what you are going to get. And I'll tell you straight away, you are getting MY opinions here, as a lot of this stuff is murky. First things first -- just what IS a credit anyway? I know this is different in some parts of the country, but for the most part, 1 credit = 1 schoolyear's worth of work in a single subject. The general expectation is that you do 30-however-many weeks (my state's homeschooling rules say basically that we are to do 34 weeks of school for a schoolyear) of a class -- like geometry, English, or history -- and that class is meeting essentially every day, for roughly an hour. At the end of that time, you've earned one credit. A 1/2 credit class might meet for a semester (half a year), or it might meet every other day for a year, or some variation. A 1/4 credit class might meet for a quarter of the year, every other day for a semester, or roughly once a week (plus a little) for an entire year. Or, in my family, it is a course that they do for a fairly short time period, but pretty intensely during that month or so. What is important is that YOU come up with something reasonable and work with that. I don't sit down and keep timesheets, nor do I make my kids track all of their hours. Some of them, yes. But not all. For most subjects though, I am going more by a "work completed" method. They finish the Algebra I book, they get an Algebra I credit. Whether it takes them a couple of months, or a calendar year. Same goes for anything else where I am getting some type of already planned curriculum (complete the Apologia Chemistry book, get a credit of chemistry). For some subjects (English), I have an expectation that they are spending 45-50 minutes a day on "English class" and when we have done that for a year (34ish weeks), they've earned a credit. Now this is one area where I know I don't have the same standards as other homeschoolers -- but I consider "English class" to consist mostly of discussions with me about literature read, time spent on grammar worksheets, time spent in "lectures" (whether by DVD or by me), time spent with me going over writing assignments, etc. I expect that they are reading literature outside of class time, and I expect that most of their "writing papers" time is outside of class time as well. The first couple of times they are writing something -- a persuasive essay, for instance -- we'll spend "class time" talking about the style of writing, reading some essays, practicing some things with it. But once they have learned the basics, most of the actual writing time is NOT "in class" time. That means a ninth grader in my house spends more time actually writing IN their English class that a senior does. There are other subjects where we do track time. Art history/art appreciation is one, as we will hit on things as we work through history, or as we work through literature that really fall into an art history course. We keep track of that time as we go, and my goal is to get 1/4 credit each year. We track hours for PE class. I'm going for a basic college-prep type of high school, here. Not that I necessarily expect all my kids to end up in college. I just think that planning a college-prep high school degree makes them well-rounded, and prepared for various options once they graduate. This could change depending on interests my kids show. 4 credits of Science (that includes biology, chemistry, and physics). For a non-science-y kid, I'd consider only 3 credits, but I don't have any children like that. 4 credits of Social Studies (that includes Government, Economics, and at least 2 credits of history). I'm pretty non-negotiable here. I'll look at Psychology, Archaeology, Humanities types of coursework, or something. There is enough variety that they can earn four credits. Another 7-8 or so credits in other "stuff" -- I hesitate to call them electives, as they aren't all elective! But at least a credit of PE, a half-credit of health, a credit of something fine arts related, and the rest can be things the student wants. Oh, and my kids are also doing Bible or Worldview work, but unless they are applying to a Christian college, I don't plan to put those on the transcript. My "next week" post will happen in the next couple days. 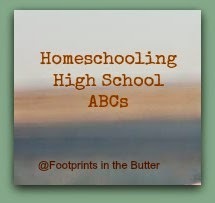 The working title for that one is D is for Discussion, which is my favorite part of having and homeschooling teens. Marcy is posting a word study, and this week is C is for CLEAN, which is TOTALLY worth reading, though a break from her word study format. There are a few dozen other amazing C posts linked up too. Go check some out!